James Compton Burnett (1840-1901) was one of the greatest and most successful English homeopaths, renowned for his intrepid style. He was above all a practitioner, putting results above doctrine. This meant he was always ready to expand his knowledge and methods in unorthodox ways. His astonishing ability to heal even the most severe pathology demonstrates the validity of his ideas. Dion Tabrett has been working in the tradition of Burnett for more than 20 years so he is the ideal author to pioneer the rediscovery of this venerable old master. In this book he presents Burnett's therapeutic approach and showcases his versatility using current examples from his own practice. Tabrett thereby casts Burnett in a refreshing new light, elucidating the true depth of his thinking and highlighting its continuing relevance for our modern age. We see the old treasures vividly come to life once more in a contemporary homeopathic practice. Burnett's flexible therapeutic strategies for casetaking, analysis and treatment are presented systematically. Topics such as the clinical line of action of the remedies and organopathy are described, as is the prescription of alternating remedies. Burnett offered new definitions of the law of similars and showed the difference between a symptomatic and a pathological simillimum. He stressed the value of the nosodes, introduced new remedies such as Bacillinum and coined the term vaccinosis. 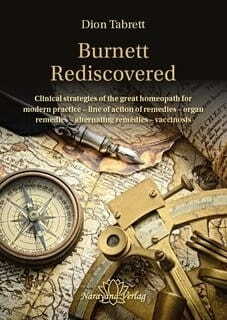 If you are looking for a fresh impetus to your homeopathic prescribing, this book may well be just what you need..